… “hundreds of studies published in the decade” have found that laboratory animals exposed to low levels of it have elevated rates of diabetes, mammary and prostate cancers, decreased sperm count, reproductive problems, early puberty, obesity, and neurological problems. Some scientists believe that humans, especially infants, are currently exposed to levels that are known to cause harm in laboratory animals. There are other chemical compounds used industrially that also act as endocrine disruptors (DDT, Polychlorinated biphenols (PCBs), Phthalates), but because BPA is used in so many common products – including many we put in our mouths – it attracted special attention. As Fast Company magazine chronicled in an in-depth article earlier this year, groups representing the chemical industry have done everything in their power to cover-up the effects of BPA on the human body and prevent government regulation. They are employing tactics used by the tobacco industry to introduce conflicting scientific data with the goal of creating confusion and doubt. When the spotlight fell on BPA in early 2008, the safety of plastic water bottles and baby bottles came into question since they have direct and frequent contact with our mouths. Because the major bottle makers – particularly Nalgene – all used BPA to harden their products, SIGG and other metal bottle manufacturers were quickly offered up as safe alternatives. Very thorough migration testing in laboratories around the world is conducted regularly and has consistently shown SIGG aluminum bottles to have no presence of lead, phthalates, Perfluorooctanoic Acid (PFOA), Bysphenol A (BPA), Bysphenol B (BPB) or any other chemicals which scientists have deemed as potentially harmful. After two years of comprehensive testing and development and a one million dollar investment in new equipment for our Swiss factory, SIGG began producing bottles with our new, next generation “EcoCare” liner in August 2008. Providing the same quality and protection afforded by the previous liner, this new powder-based, co-polyester coating has been thoroughly tested and is certified to be 100% free of BPA, phthalates, BADGE, BFDGE, and NOGE. It is also environmentally friendly as its application generates virtually no waste and utilizes no organic solvents or VOCs. Our new bottle liner is not only a technological advance; it’s a major step forward in SIGG’s journey towards sustainability. 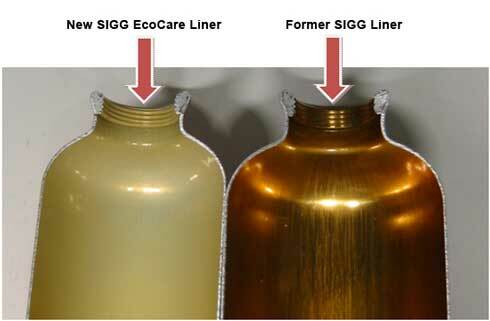 To be clear, all SIGG bottles made since August 2008 contain our new BPA free EcoCare liner. SIGG bottles manufactured prior to August 2008 have the former water-based epoxy liner which contains trace amounts of BPA. These bottles have been thoroughly tested and showed 0% leaching of BPA. It is easy to determine which liner you have, as they are of 2 distinctly different colors. 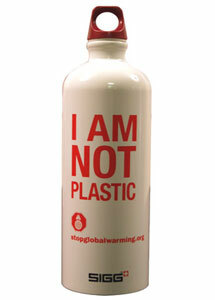 Understandably, SIGG customers are shocked and angry. The company gave the impression that its bottles were BPA-free thanks to some clever and deceptive language about BPA leaching. And there’s no question the deception was intentional. SIGG could have answered questions openly and honestly at anytime, but I suspect it didn’t want to threaten growth and profits after Nalgene refugees flocked to their product to get away from BPA. Now that the company has finally fessed-up, its reputation is in question. Sure, it claims that all its bottles made in the last year are BPA-free, but are customers really going to trust anything coming from SIGG spokes people? Casey and I have both been drinking from SIGG bottles for over a year and a half, so we both have ones with the old liner containing BPA. We feel duped, and I suspect we won’t be buying anything made by SIGG ever again. Casey already uses a BPA-free Nalgene bottle she received at BlogHer last month, and I’ve asked for a Klean Kanteen for my birthday coming up in a few weeks. This is a great opportunity for competitors, and if they’re smart, they’ll find unique ways to turn former-SIGG customers into their own via trade-in deals, etc. It’s hard to say what last week’s events mean for SIGG in the long-term. Maybe the company will manage to rebuild customer trust and loyalty, or maybe it’s on a downward slope from here on out. In any case, it’s a cautionary example to all businesses that honesty and transparency are principles that businesses should not ignore. Great post. I have a Klean Kanteen and love it.